Education, experience and examination all have a role to play in a pilot’s development, Kreisha Ballantyne muses. In 1989, I went back to school, this time in the USA. As part of a cultural exchange program, I completed year 12 in a high school in Missoula, Montana, after having completed the year 12 equivalent in Wales. The contrast was so vast, I felt I had visited two different planets. The most obvious difference (other than not having to wear a uniform in the US school, and not having to eat shepherd’s pie at lunchtime) was that the onus in the UK educational system was on examinations whereas in the US, the focus was very much on providing a huge array of experiences. For instance, in years 11 and 12 in the UK, I studied only three subjects—English literature, sociology and drama—but in great depth. In Montana, I studied the same seven subjects each day, but with a variation of topics I could barely imagine existing in a British school—drivers’ ed, journalism, yearbook and even cheerleading. Over the course of that year, I was deputy editor of a weekly newspaper, teacher’s assistant to an improv drama group and I learnt to drive. During the previous year in the UK, I had learned about socialism, communism and feminism; I developed an in-depth knowledge of the poetry of John Keats and become an expert on Japanese Noh theatre. This raises the question: which is more important—exams or experience? Was I a better-rounded person in having learnt to drive or in being able to quote large swathes of Ode to a Nightingale? Of course, the answer largely depends on what career path one desires. But what if I wanted to become a pilot? In a modern world, it’s perfectly acceptable for people to change careers multiple times in their life. Education is an ongoing process. The question we should be asking is: is the education being offered in a useful and progressive fashion, and is that education able to measure the qualities essential for that particular role? Is specialisation in an obscure and obsolete subject a useful discipline in the modern world? (The head of YouTube has a degree in history and literature.) Does the generalist have the advantage of seeing the big picture or are they just shallow? The arguments flow furiously, both ways. And can any form of education substitute for experience? Probably not, but do you really think you can make sense of your experience without a sound education in the basics? Again, I’d say probably not. In terms of the required balance between exams and experience in aviation, Australia sits somewhere in the middle, between the UK/Europe and the US. For instance, the US requires a single 100 question multiple choice exam for the CPL, whereas EASA covers 13 subjects. The current CASA requirement for CPL is seven exams. Having sat several CASA exams myself (basic aeronautical knowledge or BAK, private pilot licence, seven commercial pilot licence subjects—some of them more than twice—and the instrument rating exam) I am often left wondering whether the exams are testing knowledge of content, rather than knowledge of method. I am able, like so many, to rote learn large swathes of material for a short period of time, but if that material is not put into any context, it’s largely redundant. Take for example, pilot duty times: my instructor recently pointed out that many pilots simply rote-learn the duty times, but when posed with a question such as, ‘You’ve just landed after a three-hour flight, and your CFI asks you to fly to Broken Hill. Can you go?’ tends to cause panic, whereas ‘What is the weekly duty time for a commercial pilot?’ does not. Unfortunately, multiple choice exams are constructed to measure content. 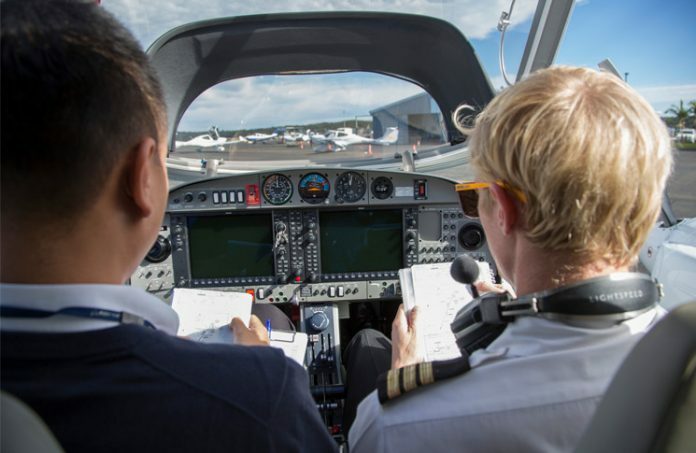 Employers are wise to the fact that their pilots are required to be more than exam-passing automatons and have the right to request a pilot’s exam results to understand their strengths and deficiencies. Airlines in particular are now interested in their prospective employer’s experiences and exam results in equal measure. A common criticism of the Australian examination system is that the exams are outdated. The current CPL navigation exam offers no GPS component, and according to research on pass rates, students struggle with, ‘ADF errors, ADF homing and recognising instrument indications signifying station passage’—all information that is outmoded given that 134 NDBs have been decommissioned this year—that it is rendered useless. The same is applied to ATPL Flight Planning, which uses the Boeing 727, an aircraft that was last built in 1984. However, CASA says there are sound reasons why questions about terrestrial navigation aids and the Boeing 727 remain on its exams. GNSS questions are progressively being introduced into exams and the number of questions candidates get on terrestrial navigation aids (NDB, VOR, DME, ILS) are progressively being reduced, but it is not expected they will be eliminated altogether as they form the basis for ‘back up navigation’ in the event that GNSS is not available. About the 727 CASA says, ‘the performance limitations of that aircraft type make it an ideal platform for assessing a person’s knowledge in the fundamentals of flight planning. The use of a more modern two- or four-engine aircraft would require significantly different planning scenarios to determine the applicant’s level of knowledge. ‘Reference to the B727 was necessary to utilise the proprietary Boeing performance data published by CASA in the ATPL-A performance manual. Furthermore, the introduction of a new airframe would result in significant cost for all theory providers; it would necessitate a total rewrite of their subject study material and courses. Interestingly, in 2013, only 39 per cent of students passed ATPL Flight Planning. The instrument rating exam (IREX) is another heavily criticised exam and anecdotally, I am meeting more and more pilots who are opting for the much more modern private instrument flight rating (PIFR) exam, which excludes redundant questions regarding NDB approaches and focuses on the approaches students will actually use. The number of students achieving a pass in the PIFR exam was 100 per cent in 2015, while the IREX (the exam of my nightmares) was passed by 69 per cent of students in the same year. That said, examinations, however imperfect, remain a valid instrument for measuring knowledge, and their very purpose is to encourage students to learn and convert that learning into experience. CFI at Starr Aviation, Adam Starr, says, ‘In general, I like the part 61 syllabus and the manual of standards as it has taken great leaps forward. I think it can go further. The instrument training is a great example where CASA has done some great things getting some consistency between command instrument rating (CIR) and PIFR but there are many overlaps and omissions as well as a disjoint with the Diploma of Aviation (Instrument Flight Operations). I am unsure why CASA did not align the two when Part 61 came in. Exams may form the foundation of the pilot’s education, but you can, and should, enrich your own experience by looking far beyond the syllabus, be it through fly-always, involvement in groups, attending courses and seminars, and reading blogs and newsletters. The most dangerous idea of all is the one that you can stop learning once you’ve passed the exam. I would suggest “…prospective employee’s experiences…” would be more appropriate? Someone known to all at Bankstown always said the IFR rating was just the start of a learning process.